Beginning in Paris on the eve of the Nazi occupation in 1940. Suite française tells the remarkable story of men and women thrown together in circumstances beyond their control. When Irène Némirovsky began working on Suite française, she was already a highly successful writer living in Paris. But she was also a Jew, and in 1942 she was arrested and deported to Auschwitz, where she died. For sixty-four years, this novel remained hidden and unknown. Berwyn Public Library discusses Suite Française. Iréne Némirovsky discusses A Suite Francesa. 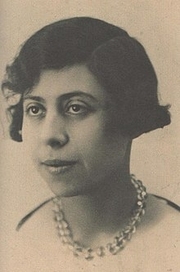 Irène Némirovsky , Suite Française. Irene Nemirovsky , Suite Française. Irène Némirovsky was brought up in St. Petersburg, Russia by a French governess, becoming completely fluent in the French language. She also learned to speak Yiddish, Finnish, Polish, and English. Following the Russian Revolution, the family lived for a year in Finland and then moved to Paris. Irène attended the Sorbonne and started writing fiction at about age 18. In 1926, she married Michel Epstein, a banker, with whom she had two daughters: Denise, born in 1929; and Élisabeth, born in 1937. In 1929, Irène published David Golder, her first novel, which was an immediate success and was adapted into a film in 1930. That same year, her novel Le Bal was published and became a play and a movie. Today Irène Némirovsky is best-remembered for her unfinished book entitled Suite Française, two novellas written during the start of the German Occupation of France in World War II as it was happening. Despite having converted to Catholicism, Irène Némirovsky was arrested and deported by the Nazis to Auschwitz, where she died of typhus at 39 years of age. Her husband died in the gas chambers of Auschwitz. Their daughter Denise was able to keep the notebook containing the manuscript for Suite Française, but did not read it for 50 years, thinking it was her mother's private journal. However, in the late 1990s, she made arrangements to donate her mother's papers to a French archive and decided to examine the notebook. Upon discovering what it contained, she had it published in France, where it became a bestseller in 2004. Irène Némirovsky is currently considered a "single author." If one or more works are by a distinct, homonymous authors, go ahead and split the author. Irène Némirovsky is composed of 29 names. You can examine and separate out names.